In Battle Creek during the early 1900's, the area at the convergence of the Battle Creek and Kalamazoo Rivers frequently flooded. At that time, the area was known locally as the "Bottoms." The Bottoms was the heart of Battle Creek's African American community and also home to industry. When the Bottoms flooded once more in 1947, and the flood waters brought commerce to a standstill for over a week, the City of Battle Creek embarked upon a flood control program called "the Cement River project." The Army Corp of Engineers was brought in and they encased the Kalamazoo River in cement. At the time, what they did was high tech, cutting edge; and demonstrated man could control nature. The cement channel destroyed wildlife and fish habitats, and the African American community living in the Bottoms was relocated. While encasing the river in cement stopped flooding, environmentally, aesthetically, and culturally, it was a horrible solution. Today there are alternatives that can control flooding while maintaining habitat and wildlife. It's time for the Kalamazoo River to be restored to a more natural state; to become a river once again, a living river that is accessible to humans, wildlife, and nature alike. It can happen here! Battle Creek has invested millions in its downtown, but the channelled river has been left to linger as an eyesore. It's time that changed. The area is a major gateway into Battle Creek, but it does not create a good impression - a channelled river with a tall fence on either side - it creates a negative impression. It could be a beautiful gateway into downtown Battle Creek. A natural river surrounded by parkland and development - full of activity. It will take money, time, and effort. 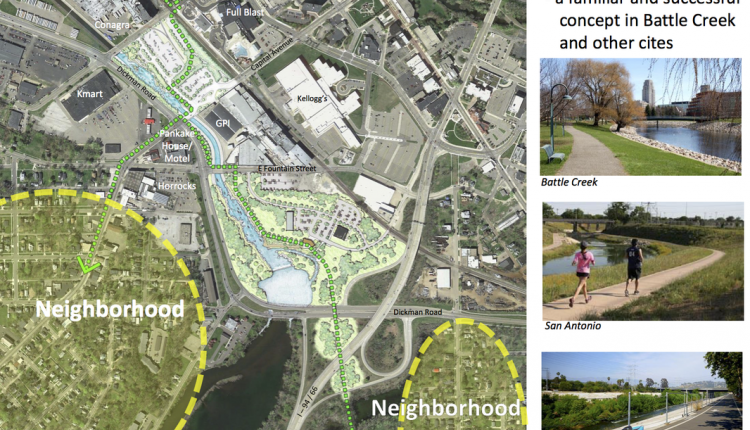 ​Battle Creek Whitewater Inc. is committed to moving this project forward, but we need your help. Donate, "like" Battle Creek Whitewater on Facebook, tell members of the Battle Creek City Commission that you want the City to make this project a priority. Before any river restoration can take place, both a preliminary and full floodplain hydrology study need to be completed. Battle Creek Whitewater is working to raise money to complete these studies through grants and donations. The concrete Kalamazoo River channel in the City of Battle Creek is an eyesore and a blight on our community. We believe that the revitalization of the Kalamazoo River is crucial to the economic vitality of the city and that a healthy, attractive river will be a catalyst for renewed investment in Battle Creek. Therefore, we, the undersigned, call upon the Battle Creek City Commission to take immediate steps to implement the recommendations of Battle Creek Whitewater, Inc., as endorsed by the city’s recently adopted Master Plan, and to restore the Kalamazoo River to an attractive, accessible waterway and community park. The Battle Creek Whitewater Project petition to Battle Creek Community was written by Michael Pignataro and is in the category City & Town Planning at GoPetition.